Where do I use my Furniture Village voucher code? Select the discount you wish to use and copy the code. Follow the link to the Furniture Village website. Select furniture for your home, and add you choices to your basket. When you’re finished shopping, view your basket. If you have a code, click ‘Add voucher code’. Enter your code in the box provided and click ‘Apply’. See your discount applied immediately. "If you’re not financially prepared to fork out a large sum of cash on a new sofa or dining set, there is no need to panic! At Furniture Village, you can enjoy offering up to 4 years 0% APR interest-free credit on orders over £400." At furniture Village, you can expect great quality and value for money as their desire for customer satisfaction runs deep in their routes. For each and every customer who visits them online or instore, excellent customer service is at the heart of everything they do. From luxury products to budget buys, Furniture Village ensures you get the right advice to lead you towards exactly what you’re looking for so you’re as happy as your home with your purchase. Whether you’re revamping your living space, bedroom, garden or kitchen, Furniture Village have an extensive collection of dining sets, mattresses, bed frames, sofas, armchairs and storage solutions for you to choose from. Shopping with a Voucher Code can help bring those costs down too, so if you’re on a budget, check out NetVoucherCodes for a fab money saving deal. If you’re looking for some inspiration, why not take a look at the Furniture Village Livings Lookbooks to uncover some great ideas! Enjoy a wide array of interior ideas including a range of different styles to suit your home. Choose from traditional carpentry and upholstery or monochrome and smart moderns styles. Give your home the ambience of your choice and find something you love with Furniture Village. It’s no secret that buying furniture for your home can cost a small fortune! However, we here at NetVoucherCodes want to help you keep those costs as low as we can which is why feature an array of money-saving deals and discount on our Furniture Village page! Grab a discount and you may find something you love for a lot less than you anticipated. At Furniture Village, you don’t have to worry about your products being under guarantee as with every piece of furniture, you will receive an offer of a 10-year guarantee. This cover the structural integrity of your items and you will even receive a 2-year guarantee for any upholstery or decorative accessories including lamps and rugs! Everything at Furniture Village is built to last so you can be confident you’re getting great value for money. Whether you’re looking to impress your next dinner party guests or your family has outgrown their old table, you’re guaranteed to find your ideal dining table at Furniture Village. Not to worry, a new dining set doesn’t have to run away with your cash, shop with a Promotional Code to knock some money off the price tag. Choose from contemporary dining sets of 4 where you can find both modern and traditional styles, or grab a practical, extending table fit for the whole family and more! You’re sure to find a dining set to match your budget at Furniture village so start your search today. Whatever your decor or size of the room you’re searching for, you are sure to find something perfectly proportioned and wonderfully comfortable sofa at Furniture Village. Whether you’re in search for a stylish corner sofa or a glamorous leather armchair, there is plenty of choice in every style and colour you could dream of. Make an investment in Furniture Village that you will not regret and what’s more, you don’t have to spend an arm & a leg in doing so. Grab a Promotional Code from NetVoucherCodes for a discount when you next buy online! Choose from Leather Sofas, Fabrics Sofas, Sofa Beds, Recliner Sofas and much more all beneath one roof at Furniture Village. 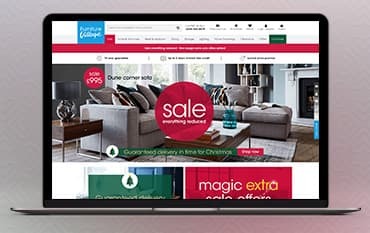 Furniture Village has a flat delivery rate of £49 on every order. For more information on Delivery and time slots, click here. If you’re wanting to return an item you will need to do so within 14 days of receipt. It’s advised you either Email or enquires in store. To find out the opening times of a store near you search for your local Furniture Village using this tool. You can also reach Furniture Village online via their contact form. If you’re looking to fill up your house with beautiful furniture, from Sofas and Armchairs to Dining Tables and Cabinets, uncover the stunning selection at Furniture Village. As the largest independent furniture retailer in the UK, Furniture Village is ready and raring to inspire your imagination with all the latest designs in furniture. Choose something you love and use a Furniture Village voucher code to help you save cash but still create stylish spaces in your home. Whether you’re on a tight budget or ready to splash the cash, you’re sure to find something that will help your home feel like new at Furniture Village.